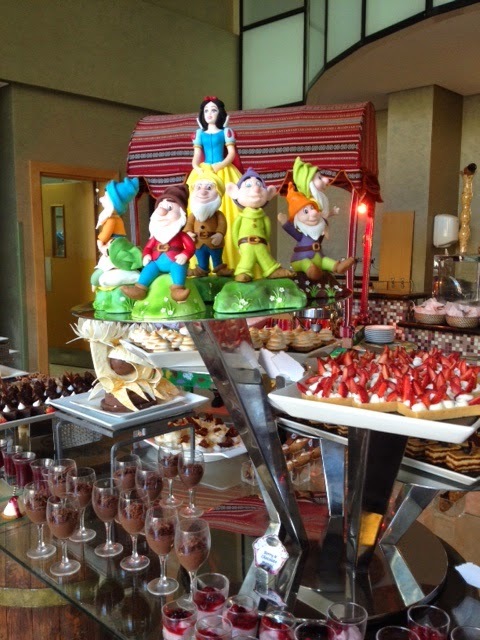 Porto Bello Friday Brunch - Grand Millenium Al Wahda, Abu Dhabi. About 2 years ago my daughter had her 5th birthday dinner here, and the thing that stood out for me, apart from her, was the food. I remember thinking, 'this is really good Italian food'. So, what is nice about having brunch at a restaurant that has a specialist cuisine, is that regardless of everything else, the food is going to be good. It was this in mind, that we went for Friday brunch. Porto Bello, or beautiful port, was to be our docking place for 4 hours. Part of the entertainment for the afternoon. Very stylish. I like brunches because I think they are good for children. The variety on display ensures that they are not bored and can step out of the horrible fast food culture that marketers and the media subject them to. The first impression you get as you enter is how lively the brunch is. 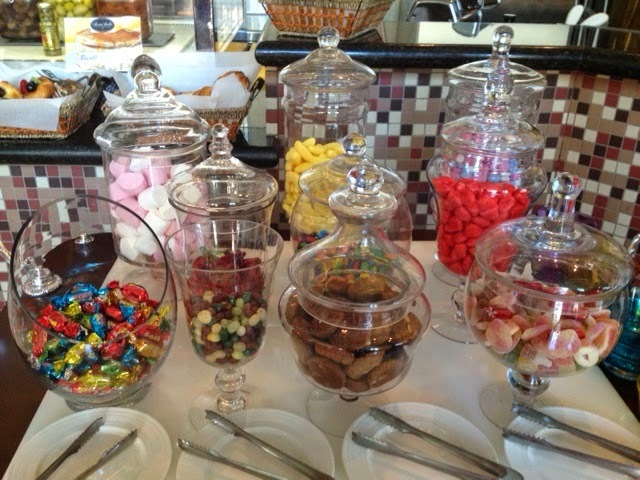 I think this is the key ingredient to a Friday brunch, otherwise it is just a normal buffet. We were greeted by the hostess and shown to our table - ironically the same table from 2 years ago! The restaurant is not very big, providing seating for around 80 inside and a considerable number outside (the latter is moot now because of the weather). I like the size of it though. There are brunches in the city that are just too big. 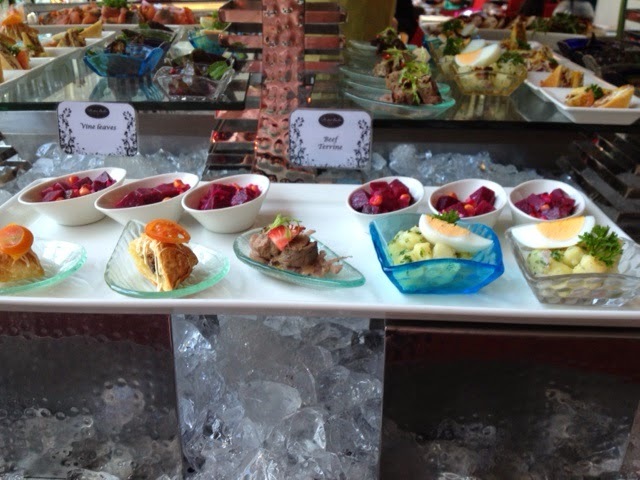 The brunch offers the usual live stations, but with the added station where you can enjoy a bit of Mexican, influenced by the TexMex theme night at its sister restaurant, Al Wahda All Day Dining on the first floor of the hotel. 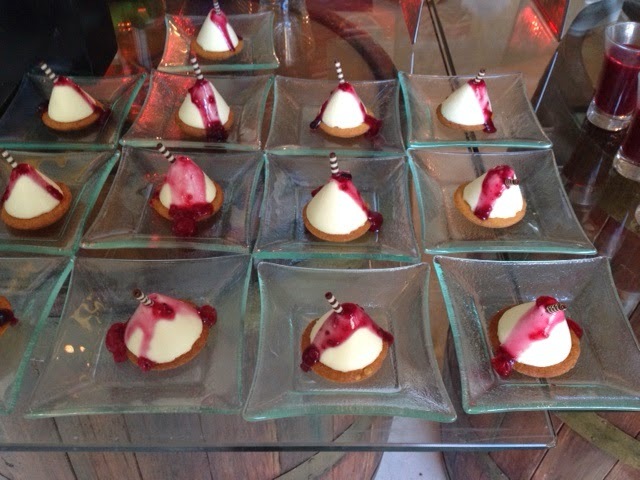 Highlights include a BBQ station outside, a very stylish salad bar with a fine selection of cold soups, beautifully presented in cocktail glasses, a cheese station with a generous choice of cheeses and a selection of jams. There is also a sushi station, expertly 'manned' by Janice, their teppanyaki chef. However, the highlight for me is the live made-to-order pizzas. You can get pizzas at many brunches but this makes the brunch here special. 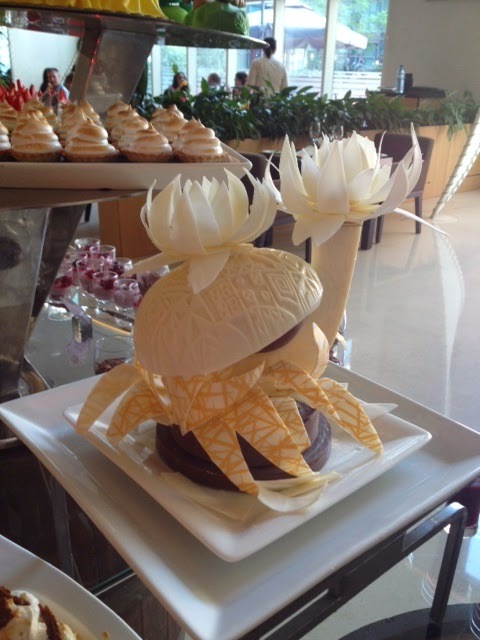 Tasteful displays throughout the brunch. 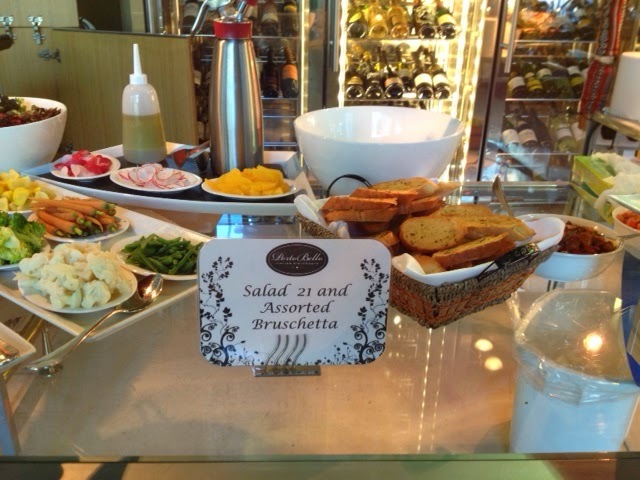 A special salad consisting of 21 ingredients. There are many other options, too numerous to mention. There were a number of outstanding dishes: the shepherd's pie which proved a hit with young and old - subtle, but flavorful. The bruschetta had me returning for seconds - crispy bread and fresh toppings. The pasta, of course. 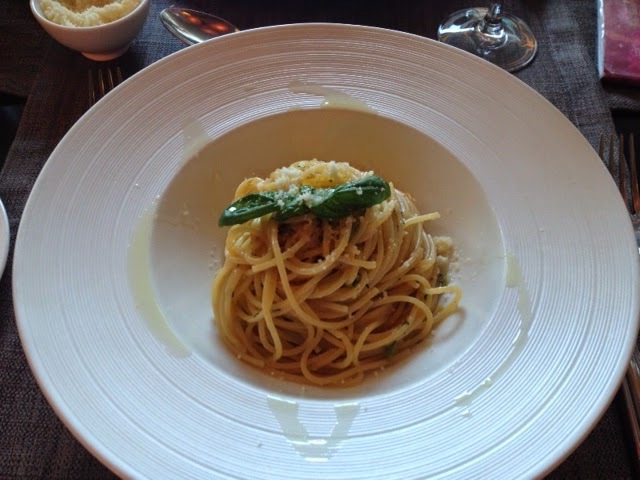 I requested the pepperoncini pasta and this was done al dente for me. Flawless. Absolutely loved it. An added incentive to attend the brunch is here is the entertainment. We were treated to two groups. The first group, Porters, gave us two sets of acoustic classics and by the time they go to the popular Pharell song, "Happy" people were dancing! Yes, spontaneous fun. 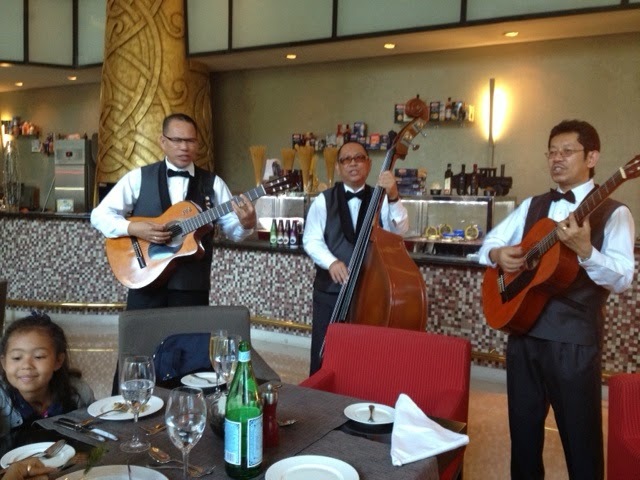 There was also a trio who moved from table to table doing mostly, but not exclusively, Simon and Garfunkel tunes. Add to this the free flowing bubbly, either Australian sparkling or French bubbly and you are bound to have a great time. Or if you prefer cocktails, you will be pleased with the choice of mojitos. Or if you walk the straight and narrow, a selection of fresh juices. 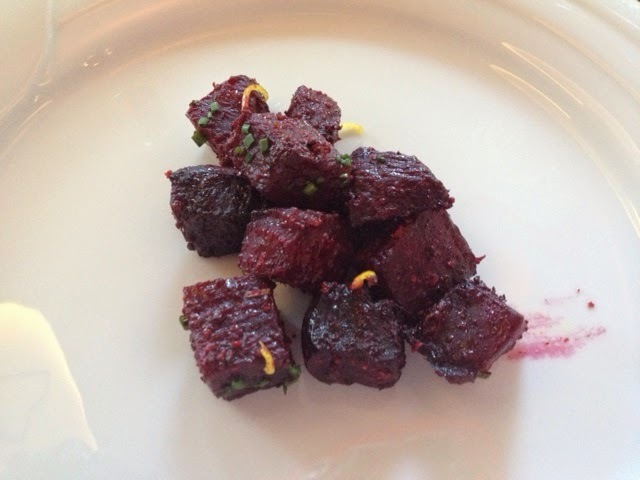 My love affair with beetroot continued. My dish of teh day - pepperoncini pasta. The waiting staff I encountered on the day were very good. Morena, tasked with looking after our table for the day, was relaxed and easy going, allowing us to be at ease. She was helpful, made recommendations and escorted Mitsuki to a few stations in the course of the afternoon. Also, the restaurant manager was visible throughout the brunch, leading by example. It was also great to see the Food and Beverage manager doing the rounds - all these factors reassure one that food and its delivery is valued in an establishment. Something for the young ones - and old. With Easter around the corner, this decorative easter egg was appropriate. To sum up, Porto Bello's brunch is one of the most under-rated brunches I have attended. 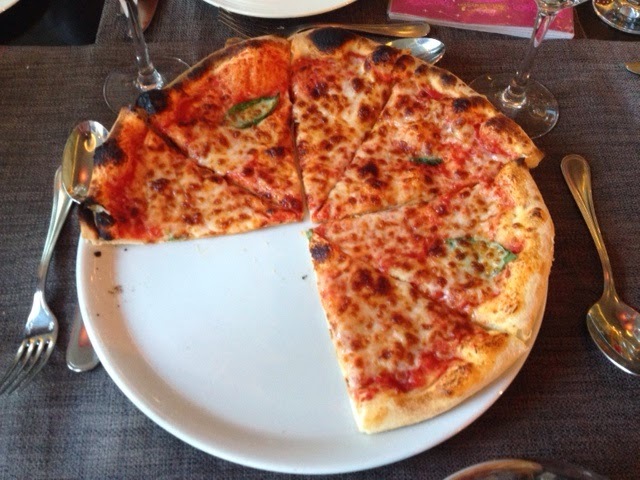 The quality of the Italian food, especially, is up there with the best in the city. 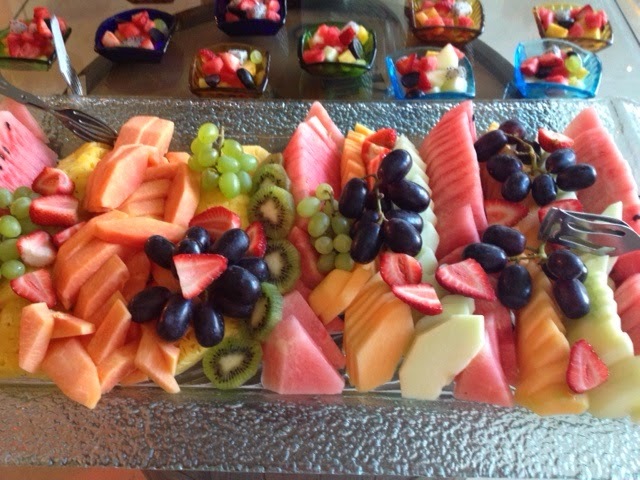 It is a family friendly brunch that offers fun but wholesome food for children and lastly, incredible value for money. This writer still has a slight headache from the brunch, but that is his fault. It was indeed a fabulous afternoon of food, drink, laughter of children and song. Nota bad way to spend the afternoon. Not bad at all. 395 Dhs++ for the above plus Champagne.